Bring your décor up to speed! When adding style and function to your home or office, an ordinary table won’t always fit the bill. When it’s a bar-height table you need, PitStop has the solution! The PitStop Furniture Crew Chief Bar Table provides the functionality of a table with the versatility of a countertop. The PitStop Furniture Crew Chief Bar Table is ideal for use in nearly any setting and is the perfect table for use with the PitStop Furniture Crew Chief Bar Chair. 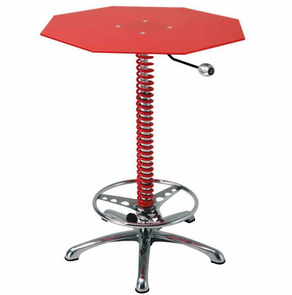 The PitStop Furniture Crew Chief Bar Table features a beautiful tempered glass top perched atop a racing suspension spring wrapped support pole. The aluminum billet shift knob handle allows for height adjustability for functional use in any application. To ensure a comfortable experience while you eat lunch, negotiate contracts, or watch the race, the PitStop Furniture Crew Chief Bar Table has a steering wheel footrest and a 26” wide track aluminum alloy base to provide stability. PitStop Furniture Crew Chief Bar Tables are designed and assembled in the USA from the highest quality materials available. PitStop Products are backed by an Intro-Tech Automotive, Inc. lifetime warranty. The quality in craftsmanship is evident in each piece of PitStop furniture.